Dec 27, 2010 New Video Tutorials! Dec 13, 2010 New Video Tutorials! Dec 1, 2010 New Video Tutorials! 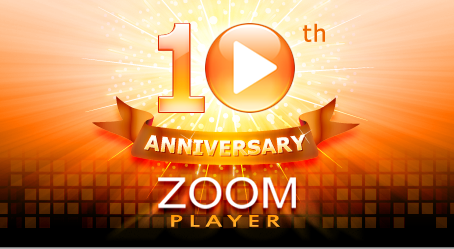 Dec 1, 2010 Zoom Player is 10 – Join the Party! 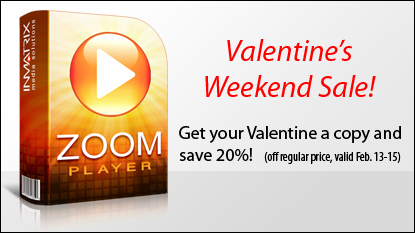 Zoom Player Marks its 10th Anniversary of Quality Media Playback for the whole family. We would like to share our success with you by giving you a 25% discount for the entire month of December. Any purchase made now will ensure your free upgrade to the next version of Zoom Player, coming soon . . . Important! Don’t forget to enter the "10yrs4ZP12-10" coupon in the purchase page's promo code box! Big Shopping Days, Small Prices! Your Shopping is not complete without Zoom Player. Get all Hot Inmatrix products at 25% off the regular price during our Black Friday & Cyber Monday sale Nov. 26th - 29th. Important! Don’t forget to enter BFCM2010 in the purchase page's promo code box! Zoom Player is now available in Swedish and Hebrew on the Language Download page. Are you getting excited to watch the upcoming Mondial World Cup? So are we . . . So much so, that we want to share the excitement with you by giving you a special 25% discount on all our products for the event's duration (from today through July 11th). To take advantage of this special sale, enter the "ZOOM-4-GOALS" (all caps) coupon code on the purchase page. To continue, visit our online shop. Multi-Monitor configuration for playing video on one monitor while leaving the secondary monitor clear for work (a 2 part tutorial). Learning how to use the right-click context menu. A video explaining what every function does with a few tips & tricks thrown in. Learn about the Zoom Player skin modes, from enhanced modes with additional functionality to minimalistic modes with more screen real estate. Visit our YouTube channel to view. We've just posted a tutorial video showing how to Configure Zoom Player's Media Library. We are planning more videos and would appreciate feedback on our Facebook page. Feb 12, 2010 Happy Valentine's Day! Buy any Inmatrix product during the Valentine's Weekend and save 20% off the listed price by entering the "4myVal" coupon. Discounts apply to all Inmatrix products, including Zoom Player Home Max, Premium and Professional, Desktop Wallshaper, Whitewash Wizard and the Zoom Player Family Packs. The valentine's wekeend sale is valid through February 13-15, 2010. Zoom Player v7 language files are now available in Spanish, Click here to download. We would like to thank all the translators involved in localizing Zoom Player. If you would like to help translating Zoom Player to your own language, please visit the translation forum for more information.